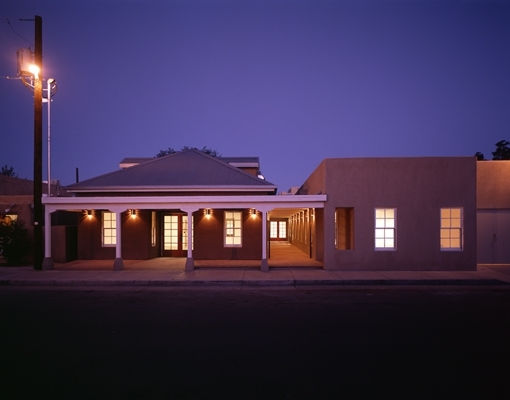 Plazuela Vigil is a 4500-square-foot new retail building that received a 2002 AWARD OF MERIT from the Albuquerque Conservation Association (TACA) for contributing to the urban quality of Albuquerque. Old Town Albuquerque is characterized by small-scale buildings that have been added onto over time. As families grew so did their houses. As a result, the context of Old Town has the organic feeling of having grown gradually over time. Plazuela Vigil respects the historic urban context of Old Town by emulating this pattern of gradual development over time. The design divides the building into two discrete parts that appear to be constructed at two different times. One part has a flat roof and is stuccoed a light adobe color; the other part has a pitched, corrugated metal roof and is stuccoed a dark adobe color. To tie the two parts together they are arranged around an intimate south-facing courtyard. To tie the development into the pedestrian- friendly urban fabric of Old Town the two parts of the building are connected by an open-air portal.